Here’s a slot that puts the ‘mayhem’ into crazy online slots: literally. Everyone loves a good meerkat and with this slot you can put the irritation of those horrific Compare the Meerkat adverts behind you! 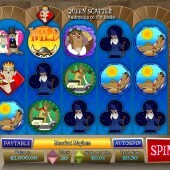 The 5 reel, 30 pay-line slot from leading developer, Microgaming, features a bewildering array of meerkats in various fantasy poses: Vikings, Pirates, Ballerinas, Cowboys, Pilots, Mariachis, Snorkelers, and Wizards. Betting starts at just $0.01 a coin, with the Cowboy symbol on the reels the top payer at 300x your line stake. It might not be a slot that has too much in the form of bonus features but there are a lot of symbols that pay out decent wins at a more frequent rate than you might find on other slots. 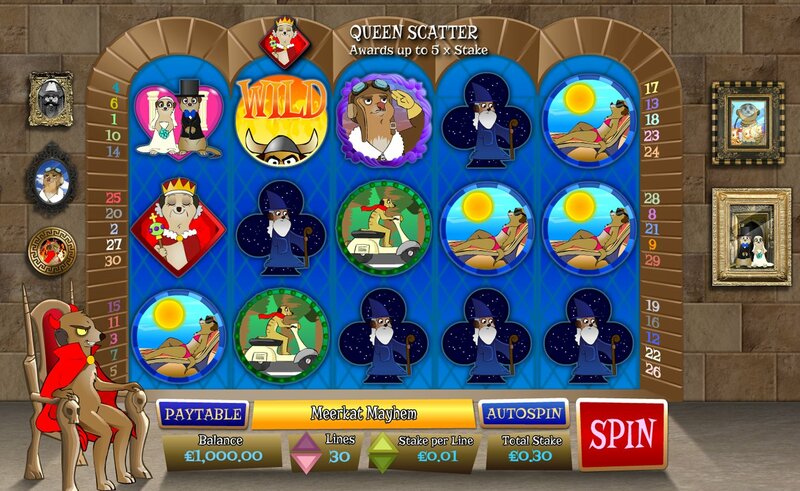 The Queen Scatter pays anywhere, and three Scatters will pay a win of 2x your total stake, with 5 Scatters paying 5x your total bet. The Viking Wild, meanwhile, substitutes for all symbols other than the game’s Scatters. Watch Out for that Devil Wild! Look out for the Devil Wild, however. When it appears it turns five other icons – the snorkeler, sunbather, moped, pilot and mariachi – Wild. That’s great if a few of those particular icons are on the reels at the same time. If those bonuses sound good, that’s as far as we go, and that’s your lot for bonus features in this game, sadly. Obviously the use of Devil Wilds makes for an interesting bonus round, with icons turning Wild turning into great cash wins, but I did find the feature hard to trigger in the first place. As for the animation on the reels, it isn’t the best in the world – nor are the graphics on display – and to be honest, I’ve seen better at other online slots from Microgaming. However, for some fast and silly animal-related fun you can’t go wrong. And while we’re on the subject of silly animal-related slots fun, check out Leander’s Mexican-themed Mad Pinatas slot or Crazy Chameleons, Microgaming’s take on the surfing scene – with chameleons.